Imagine how it must have felt for Mary Magdalene to go visit Jesus’ tomb and to find it empty. Consider the thoughts that must have been running through Peter’s mind as he heard what Mary had to say. Having, in their own ways, gone through the experience of seeing their teacher and their friend crucified a few days prior, one can only imagine the range of emotions they must have been feeling seeing that empty tomb. I think back to my year as a Jesuit Volunteer in New Orleans. We were the first group of JVs back after Katrina devastated the city. Having never visited the city prior to showing up for my volunteer year, I tried to think about what it must have been like for my co-workers and neighbors – watching their city destroyed by a flood. They must have been like Mary, Peter, and the other apostles – scared and unsure of the future after the water receded. But as we know, Jesus was raised from the dead and the city of New Orleans continues to rebuild. For all of the darkness in the world, we need to remember that after every death, whether literal or figurative, there is new life. 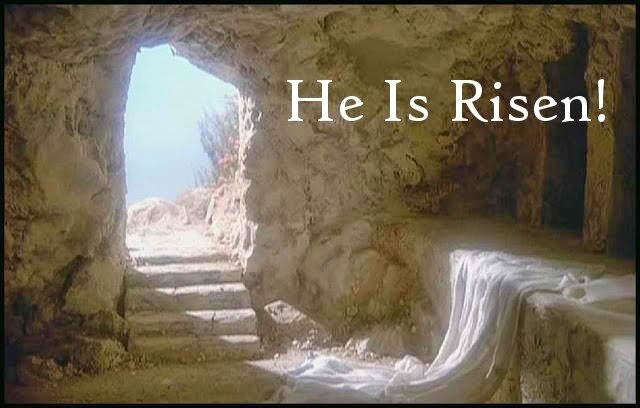 If we don’t go through times of uncertainty and sadness, we can never experience the true beauty of the resurrection. Spirituality: Take some time to read each of the Gospel stories of the resurrection. How do each of the stories differ? Where are they the same? Which is your favorite? Why? How do the stories apply to your life? Where do you see yourself in these Gospels? Social Justice: Even though it has been nearly ten years since Hurricane Katrina devastated the city of New Orleans, the city is still continuing to rebuild. Learn how you can help by donating time or resources. Visit www.ccano.org/ways-you-can-give for details. Simple Living: During Lent, you may have given yourself extra simple living challenges. Why not continue those on? Try another type of fasting, prayer, or almsgiving during the Easter season. Community: It’s Easter – celebrate! Lent is over; the Lord is victorious over death. Gather together your friends, co-workers, neighbors, and other volunteers to celebrate Easter.